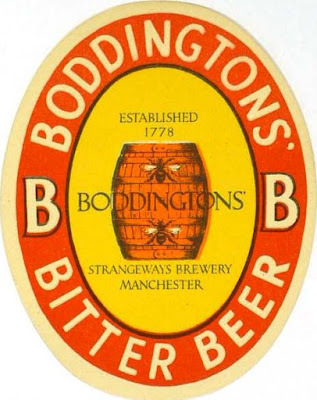 IP, the beer known as Boddington’s Bitter, had started life as the strongest of the brewery’s Pale Ales. In 1914, it had an OG of 1053º. By 1947, two World Wars had knocked that down to 1037º, the level of an Ordinary Bitter. Though the high degree of attenuation meant that it was almost 4% ABV. The influence of the war is plain to see in the presence of flaked barley, which brewers were forced to use. At breweries like Boddington who’d used adjuncts before the war, it replaced flaked maize. The invert sugar is my approximation for three proprietary sugars: 2 cwt DMS, 1.5 cwt Fla, 2 cwt. B. There were two copper hops, about which all I know is that they were English and from the 1945 season. There were also 3 lbs of hopulon, a preparation of hops. According to a Whitbread brewing record, 1 lb hopulon is the equivalent of 7 lbs of hops. So I've bumped up the hop quantity by 21 lbs. Oddly, given the vagueness of the hop descriptions, which usually just list the grower, the dry hops are specifically listed as Brewer's Gold.